Hardcover, 7.5 x 10 in. / 176 pgs / 200 color. Edited by Vicente Todolì. Text by Francesco Bonami, Stefanie Hessler, Carsten Höller, Andrea Lissoni, Philippe Parreno. 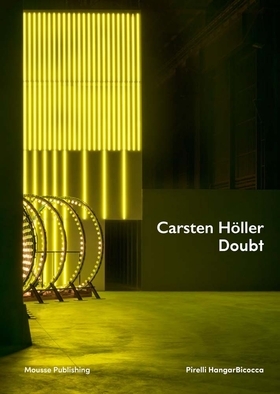 German artist Carsten Höller (born 1961) has risen to the fore of the international scene with a practice that revolves around the search for new ways of inhabiting our world. Doubt features 20 large-scale works––installations, videos and photographs that play with optics and space. Foreword and interview by Ralph Rugoff. Text by Naomi Alderman, Jenni Fagan, Deborah Levy, Helen Oyeyemi, Ali Smith, Jonathan Lethem. FORMAT: Hbk, 7.5 x 10 in. / 176 pgs / 200 color.